Manufactured to high quality standards. Greater energy, body balancing and well-being. Improves body's self-healing mechanism and quality of the blood. 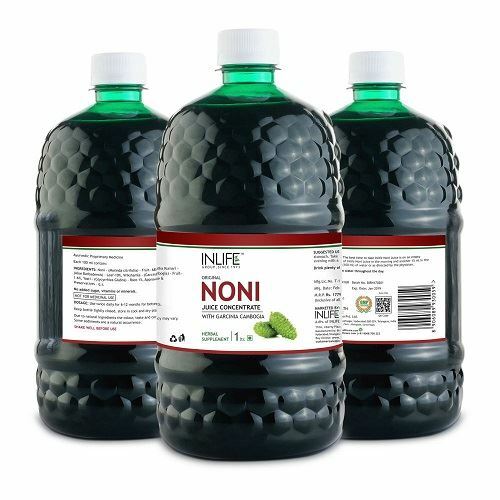 The juice of noni fruit has an impressive range of vitamins and minerals. Key Ingredients Noni (Morinda citrifolia) fruit, Grutha kumari (Aloe barbadensis) leaf, Vrikshamla (Garcinia cambogia) fruit, Yasti (Glycyrrhiza glabra) root, approved base & preservatives. 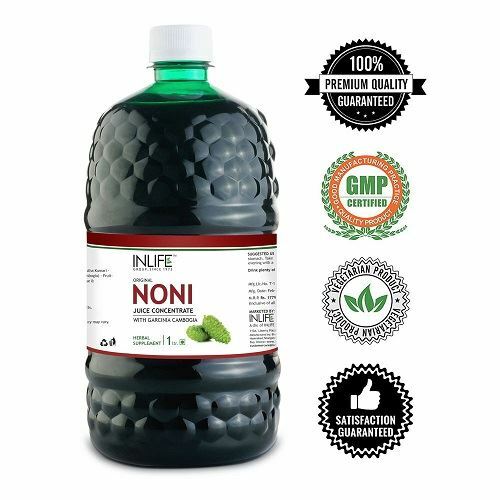 Noni Juice is derived from the fruit of a small evergreen plant known as Morinda Citrofolia or Indian mulberry - a super antioxidant and a natural detoxifier and has been used for more than 2000 years to support the entire body function. 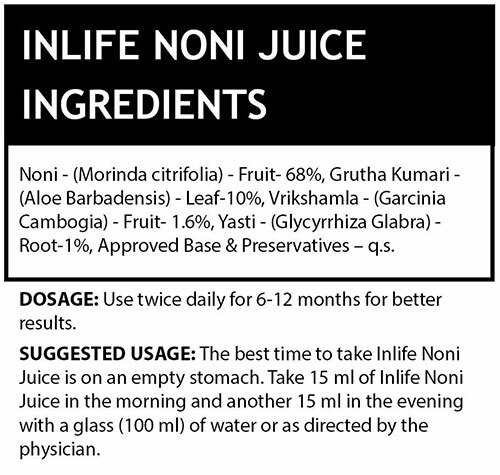 INLIFE NONI Juice Concentrate contains safe and all natural ingredients and is manufactured to high-quality standards. 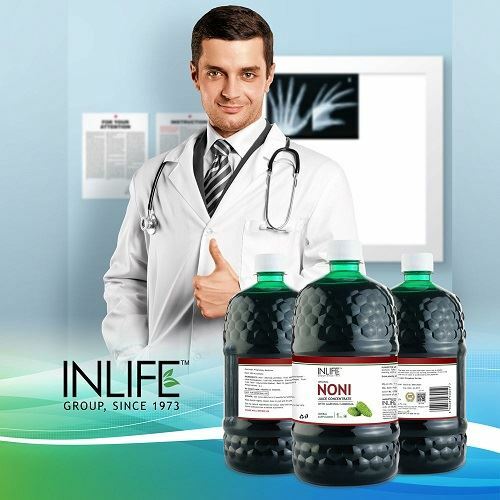 INLIFE Noni juice concentrate combined with the goodness of Garcinia and Aloe Vera is a powerful, health-giving food formulated from nature for greater health, greater energy, body balancing and well-being. Noni is known to help revitalize cells & tissues, improves body's self-healing mechanism and quality of the blood. 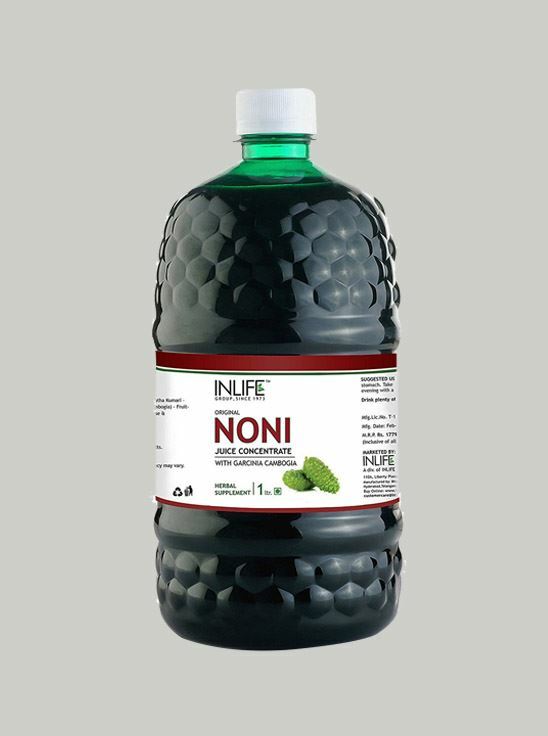 The juice of noni fruit has an impressive range of vitamins and minerals. 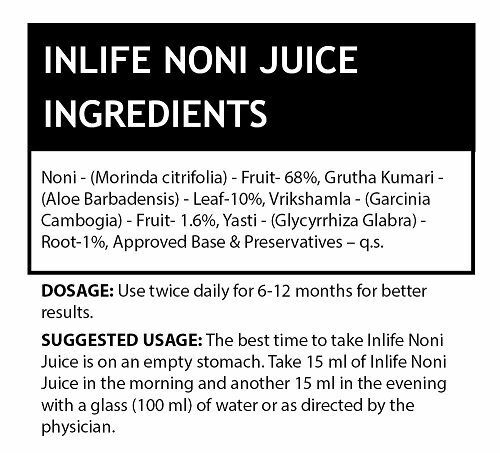 Suggested Usage: The best time to take INLIFE Noni Juice Concentrate is on empty stomach. Take 15ml of INLIFE Noni Juice in the morning and another 15ml in the evening with a glass (100ml) of water or as directed by your physician. Consider ordering one bottle for yourself and another for a friend or loved one. Keep each other motivated and reach your goals together and more quickly. Take 15ml of INLIFE Noni Juice in the morning and another 15ml in the evening with a glass (100ml) of water or as directed by your physician.